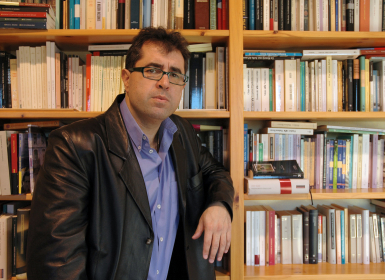 Xosé Carlos Caneiro is an accomplished narrator, poet and journalist. He is one of few writers to have won all three major Galician fiction prizes: the Blanco Amor, the Xerais and the García Barros. He is best known for his series of five novels The Misfortune of Solitude (1992, the Xerais), A Game of Apocrypha (1997, the Torrente Ballester and finalist for the Spanish National Book Award), Melancholia Perhaps (1999, the García Barros), The Centuries of the Moon (1999) and Ébora (2000, the Blanco Amor and the Eixo Atlántico). His novel Borges’s Rose (2000) won him the Vicente Risco Prize for fantasy literature. He has received several prizes for his work as a journalist and is a regular contributor to newspapers such as La Voz de Galicia. Ébora (464 pages), first published by Edicións Xerais in the year 2000, is the fifth and last in a series of novels that includes The Misfortune of Solitude, A Game of Apocrypha, Melancholia Perhaps and The Centuries of the Moon. Divided into twenty-five chapters, it is widely regarded as one of the author’s finest works. Life was the place where the stars had deposited their tiny body, accompanied by look-alikes and things and artefacts and implements and devilish tubercles, capriciously human, which didn’t let the constant light of the infinite be seen. That was the thought that jolted him before taking the most important decision of his sterile existence, the second significant decision in twenty years. He rushed to jot the words down in his minuscule spiral notebook and arranged a reflection on the apparently absurd nature of his thought. He meant that the rest, the others, the mundane, polymorphous, complex humanities – neighbours, colleagues, people: look-alikes – prevented one from reaching a settled state of equilibrium, the joy of matter and non-matter and landscapes and multi-disciplinary devices – things and artefacts – the good fortune or enjoyment of existing. The others were a cold, glacial air that had frozen his heart, his determination or desire or hope. The others stopped him contemplating life as a jubilant journey on which one could still encounter enthusiasm and new feelings and emotions and encouragement. He was dead because the world denied his life. He had been dead all these years. And he wasn’t going to put up with another minute of that hell of demons and flames and tridents that kept on pricking his weary skin. The constant light of the infinite, the longed-for happiness, seemed like a doable affair. Perhaps a moon within reach of his small, feeble hands, a star he could kiss with the lips of a loser who no longer wanted to lose, ever again.